Just because you're in your 70s doesn't mean you shouldn't still be buying stocks. Seriously. It may sound nuts to even think about buying stocks if you're in your 70s, but the reality is, if you've made it this far, you're likely to make it a lot farther. According to the U.S. Census Bureau, someone who was 65 in 2008 could expect to live another 18.7 years on average. That means someone who's 72 today is likely to live to almost 84 or beyond. And with more than a decade of life ahead, there's good reason to invest at least part of your nest egg in stable, value-focused stocks that offer some opportunity for price appreciation while also paying a dividend for income today. With these things in mind, we asked some of our top contributors for a stock they think 70-somethings out there should consider putting in their portfolio. The list they compiled is a veritable blue-chip special, including industrial powerhouses such as Caterpillar (NYSE:CAT) and General Electric Company (NYSE:GE), communications giant Verizon Communications Inc. (NYSE:VZ), consumer-brands and healthcare leader Johnson & Johnson (NYSE:JNJ), and Warren Buffett's favorite commercial bank, Wells Fargo & Co. (NYSE:WFC). Here's what our experts had to say. Todd Campbell (Johnson & Johnson): Rock-bottom interest rates mean that it's become difficult to find bond investments that can kick off enough income, and that's left older investors increasingly hunting for quality, dividend-paying stocks such as the other names being mentioned here. J&J operates a variety of healthcare-oriented businesses that includes consumer products such as Band-Aid, pharmaceuticals, and medical devices. Last year, J&J's various businesses generated a whopping $74 billion in sales, up 4% from the year before, and adjusted earnings per share of $5.97. In addition to offering investors the benefit of solid sales and profit, J&J also pays a dividend that, at current share prices, works out to a 3% yield. And if you're concerned about what could happen if we fall into a recession again, this little tidbit may help you worry a bit less. When the S&P 500 plummeted 36.7% at the height of the financial crisis in 2008, J&J's shares fell just 7.7%. Selena Maranjian (General Electric): If you're in your 70s, a stock to consider is one that might well have been in your grandparents' portfolios: GE. That doesn't make it unexciting, though. It's a conglomerate with businesses spanning aviation, healthcare, and energy, among other things -- and it's also in flux. The company is morphing into more of an industrial infrastructure company, shedding finance and appliance units. In energy, for example, GE has many profitable operations, such as grid modernization, ultra-efficient gas turbines, massive wind turbines, and even nuclear power plants. The company's annual free cash flow is well below decade-ago levels, but it's still rather hefty, topping $15 billion. General Electric is looking forward, not back, with a strong "Ecomagination" commitment to cleaner technology research and development. It has invested $15 billion in Ecomagination so far and is aiming for $25 billion by 2020. It reaped $34 billion in 2014 revenue from Ecomagination offerings. It's modernizing factories with 3-D printing, laser inspection tools, and the flexibility to produce different products. In its last quarter, management noted: "We delivered good first-quarter results in our industrial businesses, with 14% growth in operating EPS. And last week, we announced a new plan to create a simpler, more valuable industrial company by selling most GE Capital assets, a major step in our strategy to focus GE around its competitive advantages." General Electric is a solid dividend-paying stock, too, which should be of great interest to many septuagenarians. It recently yielded 3.4%, and after having slashed its payout in 2009 during the credit crisis, its dividend has been growing steadily, more than doubling over the past five years. GE's order backlog has grown to a record $263 billion -- enough to keep it busy for quite a while, and reassuring to retirees who are looking for some stability in their investments. Sean Williams (Verizon): Just because you've entered your golden years, it doesn't mean your time to take advantage of the stock market has come and gone. With inflation still your enemy and most fixed-income investments netting negative real-money returns at the moment, I believe it's time to give Verizon a look. Why Verizon? First of all, it's a fairly simple business model to understand. Sure, it may have complicated technology that runs its networks, but when you're buying Verizon. you're buying into a company that's first and foremost focused on providing content and connections to consumers. Its U.S. wireless business (with 108.5 million total subscribers), Internet, TV, landline phone, and streaming services are going to make up the bulk of Verizon's revenue generation. What's great about the products Verizon offers is that there tends to be minimal competition -- homeowners and/or cell-phone users often only have one to four choices for a content or wireless provider in their area -- and the product/service being offered is being considered more inelastic as time goes by. In other words, people can't seem to live without smartphones or the Internet, meaning Verizon possesses growing pricing power and generates somewhat predictable quarter-to-quarter cash flow. Verizon also boasts a beta of just 0.4, meaning it's only about 40% as volatile as a corresponding move in the broad-based S&P 500. Seniors are going to appreciate this, because it means a good chance of preserving capital, even during a possible recession. Lastly, Verizon is currently paying a juicy dividend that works out to a 4.4% yield. That's more than twice the average of the S&P 500 and the current rate of inflation, giving seniors a nice way of generating additional real income in their golden years. Dan Caplinger (Caterpillar): Many retirees stick with ultra-conservative stocks that tend not to move up or down very sharply over the course of the business cycle. If you're willing to take on some risk, though, investing in cyclical stocks at the right time can be extremely lucrative. One example is Caterpillar , which has been going through a severe cyclical slump in its heavy-equipment business. Essentially, everything went wrong in quick succession for Caterpillar. First, the slowdown in infrastructure and construction activity globally ate into its bread-and-butter business. Then, the plunge in gold, copper, and other mined commodities hurt its recently acquired mining-equipment business, and sustained low prices have led many of Caterpillar's mining company customers to put off capital expenditures on equipment indefinitely. Most recently, the plunge in crude oil prices has cost Caterpillar one of its last remaining sources of strong growth, as energy company have also reduced their spending in order to conserve cash. Strength in the U.S. economy is one of the few bright spots for Caterpillar right now, but if you believe the rest of the world will recover, then the heavy-equipment maker's low share price is an opportunity that even a retired investor can appreciate. 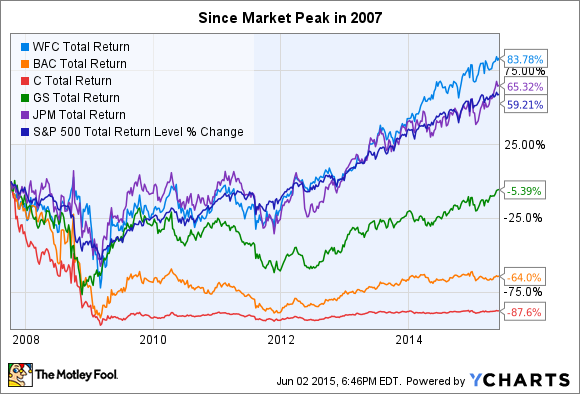 Caterpillar is far from risk-free, but it's worth considering for a retiree portfolio. Since before the market crash in 2008, Wells Fargo's stock has not only outperformed essentially all of its big-bank peers, but it has also performed better than the S&P 500, strong evidence of just how well managed the bank was before, during, and after the financial crisis. Wells is also one of the few banks out there that's paying out a higher dividend today than it was before the recession, currently yielding about 2.5% based on recent stock prices. Management has been able to increase payouts every year since 2011, recently increasing it 10% for 2015. Whether you're 25 or 75, Wells Fargo is the kind of high-quality company that's a fit in just about any portfolio.